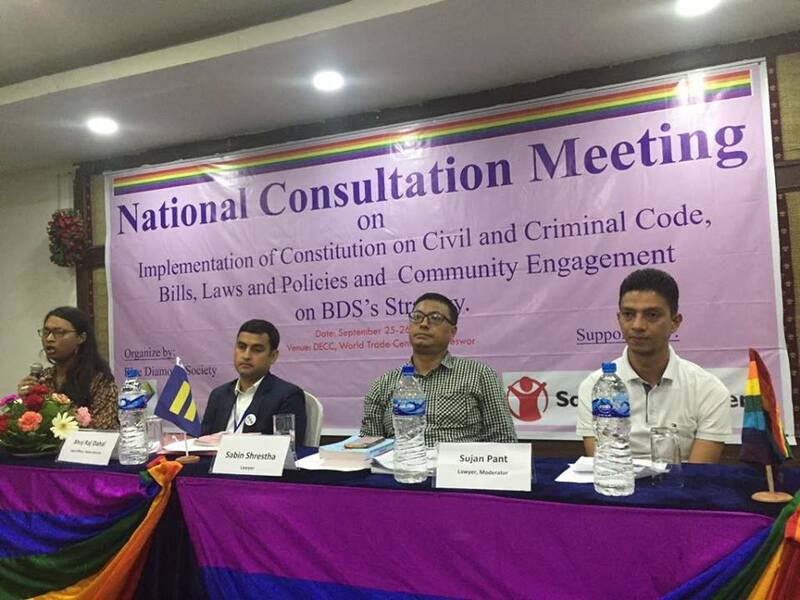 Kathmandu (Pahichan) September 30 – An amendment proposal has been registered at Parlaiment, demanding to provide citizenship to LGBTI community on the basis of gender identity. Out of 103 amendment proposals registered in Parliament, one is related to citizenship based on sexual and gender identity. Lawmaker Rajendra Shrestha registered the proposal demanding to provide citizenship to the members of this community as per their gender identity and wishes. Speaking at National Consultative Meeting Legal Advisor at Ministry of Home Affairs Bhoj Raj Dahal said discussions are underway. He said though it is difficult to change the previous name mentioned in citizenship, members of this community could easily get citizenship. He requested members of this community to lobby as discussions are underway for the amendment of proposal. Sabin Shrestha, Executive Director of Women Law and Development Forum citizenship must be provided to this community changing their names and gender identity. He said our mentality to view sexual and gender minority must be changed. Advocate Sujan Panta said there is not hassle-free situation for sexual and gender minority to receive citizenship as per their gender identity. “Some district administrator officers seek medical report which means they have not gone through the law formulated by government. He said one member of this community was not allowed to recruit in temporary police, and later gave up the citizenship. There is not easy way to get the citizenship as Chief District Officers seek medical report from this community as a pre-condition to issue citizenship. Members of sexual and gender minority said state should provide citizenship to the members of this community.